You will earn 3,781 Reward Points. Earn 1 reward point for every 1 dollar spent. 11" cooking height on 4" adjustable legs. Stainless steel 4" back and tapered side splashes. Stainless steel front, sides and 4" adjustable legs. 1⁄2" steel plate for 24", 36" and 48" units; 3⁄4" steel plate for 60" and 72" units. Available in 208V or 240V, 50/60 Hz, 1 or 3 phase power supply. 480V, 50/60 Hz 3 phase power supply. 3 1⁄2" wide front grease trough empties into a large capacity grease drawer. 60" and 72" models have two grease drawers. 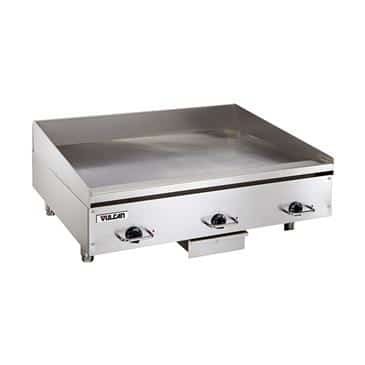 Two solid sheathed tubular incoloy heating elements, one snap action thermostat and cycling light per each 12" griddle width. Thermostats adjust from 200° to 450° F.
Stainless steel stand with marine edges and casters. Cutting board, condiment rail, plate rail and banking strip accessories. Heavy duty electric griddle. Stainless steel front and sides. 11" cooking height on 4" adjustable legs. 1⁄2" steel plate for 24", 36" and 48" units; 3⁄4" steel plate for 60" and 72" units. Tubular incoloy elements and one snap action thermostat for every 12" of griddle width. Thermostats adjust from 200° to 450° F. Stainless steel 4" back and tapered side splashes. 3 1⁄2" wide front grease trough empties into large capacity grease drawer. Available in 208V, 240V 50/60 Hz, 1 or 3 phase. 480V 50/60 Hz 3 phase. NSF Certified. UL Listed. UL Listed to Canadian safety standards.